The prize for the Best Young Researcher Contribution Content was awarded to postdoctoral researcher Ing. 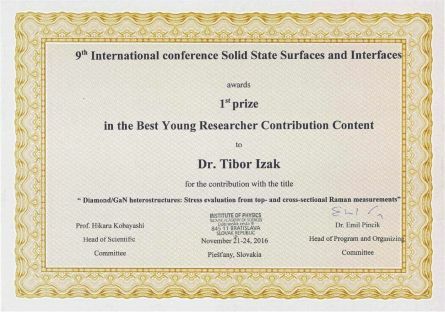 Tibor Ižák, Ph.D during the international conference on thin films, surfaces and interfaces (Solid State Surfaces and Interfaces, SSSI), which was held from 21 until 24 November in Piestany, Slovak Republic. SSSI 2016 consisted of 26 invited lectures (from total 31 lectures) and 27 posters. The winning contribution "The Diamond/GaN heterostructures: Stress evaluation from heating and cross-sectional Raman measurements" is a collaboration between teams of the Laboratory of diamond structured Institute of Physics, Czech Academy of Sciences in Prague (group of Dr. A. Kromka) and Electrotechnical Institute of Slovak Academy of Sciences in Bratislava (group of Dr. G. Vaňko).